Reminder! McCoy’s first sanctioned Olympic Lifting meet at Muscle Beach this morning. Although we do not know when he will lift, the first heats will start at 1130, ladies lift first. 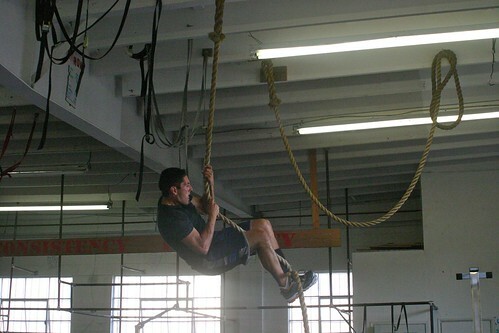 20 minutes to warm up to your workout weight and practice muscle up or progression thereof. Notes: This is an advanced WOD that requires a bit of space and scaling opotions. Depending on the number of athletes and scaling choices, we may have to run heats. Friends, Family, Coworkers, and Naysayers. That’s what the acronym stands for. I was reflecting on how, several 201s ago, Ariel asked me how I describe CrossFit to my family and friends. I immediately told him, ‘I DON”T describe it to them. I just live my life and do my thing.’ I knew that answer was confounding to them, and would only make sense after at least 6 months of CrossFit. So I have stolen a post on this very topic from my one of my great buddies Chris Mello of CrossFit 818 in Glendale. For your consideration on what to do with your FFCNs . . . Your Friends, Family, CO-Workers and Naysayers are everywhere. You can run, you can hide but eventually they are going to find you. And when they do you can rest assure that they are going to inquire, ask, judge, hate, etc… about the new you. The new CrossFit/Paleo you! At the Paleo Posse meeting Monday night we discussed this very topic and I would like to review and add too this important topic so we can arm ourselves with the knowledge and confidence to handle anyone of those reactions ‘these’ people are going to give you. I have learned (from the Whole 9) that there are 5 simple ways to handle any reaction to your FFCOWN. Lead by quiet example. This one is first for a reason. Ever heard of the phrase, “Actions speak louder than words?” Your results will speak for themselves (and its the sweetest too:-). After the first few weeks, when your energy has sky rocked, your skin is clear, your aches and pains are gone and you’ve shed some fat or built some lean and mean muscle, people will notice, and they will ask you what you’ve been doing. It’s kind of hard to doubt the method when the results are right there in front of them. So let your experience shine through, answer questions if asked but don’t waste your breath trying to convince, cajole or persuade others before they’re ready. Just be a living example of what this way of eating could potentially do for them. Pick your battles. Whether you like it or not – you can make people feel bad about themselves just by rolling up to the lunch table. The way you eat may very well remind people that they aren’t eating the way they should, or could, or might want to. Its not YOU it’s THEM! They are on the defensive the minute you plop your salmon and vegetables next to their Lean Cuisines and crackers. Now is not the time to point out the dangers of grains, or comment on the study you just read linking diet soda to obesity. Keep your lunch to yourself, and encourage others to do the same by not responding to their pokes, jabs or attacks on your “weird diet”. If someone is truly interested, have the conversation away from the crowd, when you can speak privately and not be interrupted by the haters. Refer to “scientific evidence” cautiously. I’m not saying you shouldn’t research and cite information from the likes of Loren Cordain, Robb Wolf or Gary Taubes. What I am saying, however, is that for every science-y article you find that talks about, say, why dairy is bad… there are a hundred just as science-y articles that will say the exact opposite. My recommendation? Unless you’re totally on the ball with scientific references (and able to smartly refute the opposing side on the fly), don’t let the scientific research be the only leg you choose to stand on. Refer back to point #1 – lead by example, and cite REAL people who have had REAL results. When outnumbered, fall back. You may very well find yourself stuck in a battle that you just can’t win. It’s a family dinner, your parents, siblings and children are at the table and you’re being hammered with doubts, skepticism and outright criticism. Take a deep breath, smile and simply fall back. In the end, the only person whose health and wellness you are responsible for is YOU. And while it may pain you to see the unhealthy behaviors exhibited by your friends and family, ultimately, they are responsible for their own lives, and their own choices. So rather than spark a bitter feud or ruin a birthday party, swallow your ego, your pride and your frustration and simply say, “Well, this is actually kind of working for me right now, but I hear what you’re saying and I really appreciate your thoughts. Now let’s get back to enjoying this delicious meal!” Sometimes, that’s all you can do… and that’s okay. Refer back to point #1… if people are open to change, eventually THEY will come to YOU, and you’ll get that opportunity to help them. Which situation have you found yourself in recently? How did you respond? Any funny stories?